Richard Stone won’t rest until every Scout unit includes STEM elements in its regular monthly program. But he doesn’t think you should have to wedge STEM in with a crowbar. 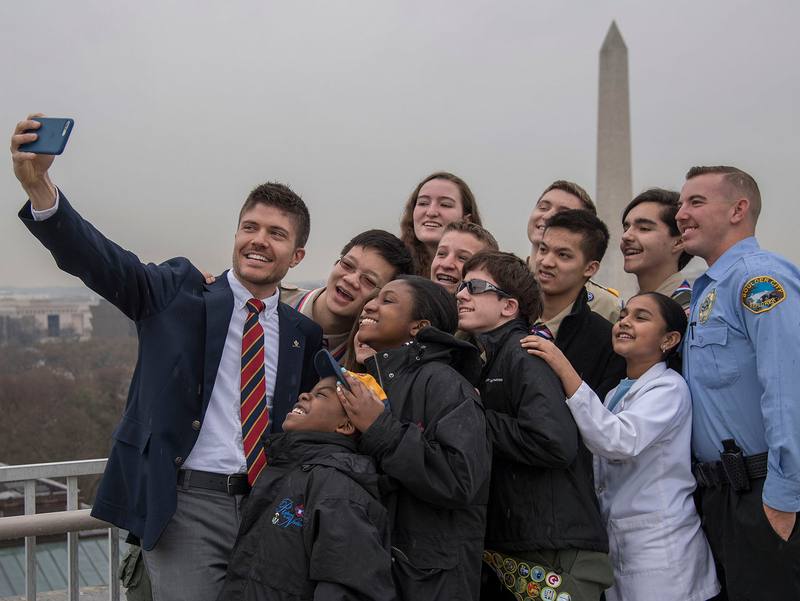 Instead, the education and training leader of the BSA’s National STEM/Nova Committee says, it’s easy to integrate STEM activities into the fun you’ve already got planned for your Scouts and Venturers. And if you happen to earn some Nova awards along the way, even better! Dr. Stone, who has two degrees in physics and earned his Ph.D. in materials science, shares more below. Our guest blogger with the famous Pedro at the 2014 National Annual Meeting. A wise trainer once explained to me that an active troop doesn’t have to plan to work on Camping, Cooking and Hiking merit badges — earning those are a side effect of an active program. This is the time of year that most units develop their Annual Program Plan. Include activities that are fun, challenging and exciting. Support advancement, and maybe help Scouts earn awards. Look for opportunities to integrate STEM and Nova activities into your Annual Program Plan. Last year at a Blue and Gold banquet, I watched a group of Webelos cross over to Boy Scouts. They all earned several activity pins like Scientist, Engineer and Geologist — and also the Science Everywhere! Nova award. The Webelos leader explained that after the boys earned their Arrow of Light advancements and some activity pins, the natural follow-on was to work on a related Nova award. They had the time, and the Scouts were interested. A counselor who is also very active in her pack extended the idea further. Many of the activities for belt loops or activity pins naturally extend into Nova award activities. Why not group them together: do the belt loop activity and the Nova activity as a set? When working on the Forester activity pin, take a field trip to look at local trees. Measure the height of a tree, and the Cub has earned part of the 1-2-3 Go! Nova award. You could easily work several related activities together in a month or two of meetings with the same theme. Integrating program activities works for Boy Scouts too. Many Scouts earn Canoeing, Motorboating, or Small-Boat Sailing merit badges at summer camp. Why not expand on those to work on the Start Your Engines! technology Nova award? If the troop participates in a STEM camporee and finds some of the activities fun, find a merit badge or Nova award that explores those topics. The lesson I learned long ago for Camping, Cooking and Hiking also applies to science, technology, engineering and mathematics. Great program is built with activities that lead to fun and advancement. Integrate related activities to enhance your program.